Customers visit the apartment project Hoang Anh Gold House in Phuoc Kien, Nha Be District, Ho Chi Minh City. 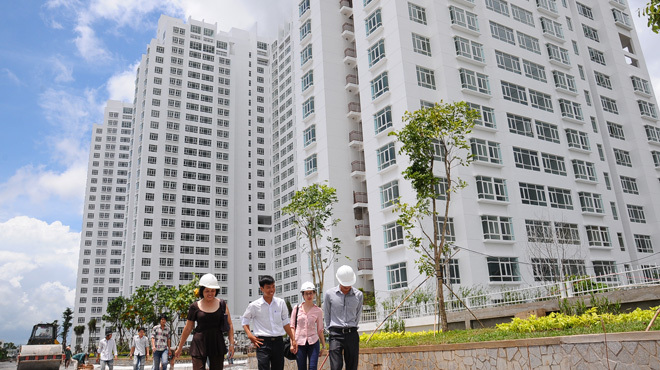 More than US$1.2 billion in foreign direct investment (FDI) was channeled into the real estate industry in Vietnam in July, bringing the total figure in the first seven months of this year to $1.69 billion, according to the Foreign Investment Agency under the Ministry of Planning and Investment. About $1.22 billion was poured into the real estate sector last month, which was nearly triple the total capital flowing into the industry in the January-June period, at $465.5 million, the agency said. This resulted from the effect of the new housing law paving the way for foreign individuals and organizations to own properties in Vietnam in the long run. With the July figure, foreign investment flows into the realty sector accounted for 19.3 percent of the total FDI making its way to the Southeast Asian country in the first seven months, the agency said, adding that the realty FDI ranked second after that in the processing-manufacturing sector. The largest contribution to the newly licensed FDI in the real estate sector was a $1.2 billion observation tower complex project invested by Empire City Limited Liability Co., a joint venture between Tien Phuoc Co. Ltd., the Tran Thai real estate company, and UK-based Denver Power Ltd. The project, located in the Thu Thiem new urban area in District 2, will include a high-class commercial center, a five-star hotel, apartments, offices, and an 86-story building covering an area of 14.5 hectares upon completion. The building is expected to become the tallest building in Vietnam. Generally, total newly registered and additional FDI capital topped $8.8 billion in the January-July period, down eight percent compared to the same period of 2014. Meanwhile, foreign investors disbursed $7.4 billion in the first seven months, an 8.8 percent year-on-year rise. In terms of investment areas, processing-manufacturing occupied the biggest share with $6.14 billion, accounting for 69.7 percent of the total newly registered and added capital. South Korea was the leader with a capital of $1.91 billion, accounting for 21.7 percent of the total, followed by the UK with $1.24 billion and British Virgin Islands with $835.3 million, the Foreign Investment Agency said. Ho Chi Minh City attracted the largest FDI amount in the seven months with $2.42 billion, representing 27.5 percent of the total. The southern economic hub was followed by its neighbors, Binh Duong and Dong Nai Provinces, with $1.11 billion each.